Clear, mathematical explanations within a learning system that emphasizes the fundamentals—Preparing, Practicing, and Reviewing. Safe, dependable, accurate, and precise—with abundant and varied exercises. Introduces trigonometry using te right-triangle approach. Chapter Test Prep Video CD provides the student with worked-out solutions to every Chapter Test exercise. 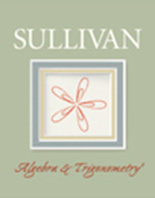 MathXL® Tutorials on CD—A tutorial and self-study tool. MathXL®—An optional, online homework, tutorial and assessment system.